The HaDiKo (short form of Hans - Dickmann - Kolleg) is made up of five buildings. Depending on the size of the buildings, they house between 180 and 265 students on multiple floors. On each floor live between 13 and 15 people, they share a large kitchen and a bathroom. Don't worry, this is really unproblematic, because the students usually get up and go to bed evenly distributed over the day. All in all, we have 999 rooms, thus actually coming close to a small village. Therefore, you will always find somebody interesting. The HaDiKo is a perfect place to get to know people (e.g. also by doing activities in the self-administration). There are several working groups you are welcome to join (AK Sport, AK Multimedia, AK Elektronik, AK Holz and many more). Not to mention our computer network, the HaDiNet, which emerged completely out of own-initiative and which, through the use of modern fibre-optics, brings the excercise papers and lecture notes into each room at a phenomenal speed. Moreover, we have a music room, billiard room, table-tennis room and a 'Kicker'. Almost each day a bar is open and at regular intervals, our Karlsruhe-wide legendary house festivals take place. The HaDiKo is a self-administered dormitory, that is to say the residents themselves handle the allocation and administration of the rooms. More to the self-administration you can find here. The rooms have sizes between 10 and 20 square-meters, they cost between 174 € and 291 € including heating and electricity (for a more detailed list have a look here). Normally, the size of the rooms is sufficient for living and studying. The rooms are ready-furnished with a wardrobe, a bed, a desktop, an office chair and a bed table. If you like, you may additionally bring your own furniture. On every floor, there is a kitchen with cooking opportunity, one large eating table, work space, a couple of refridgerators and one or two ovens. Some floors have also organized microwave ovens, dishwashers, toasters or similar things on their own behalf. In each room there is a basin, a sufficient amount of toilets and showers exist on the floor. There is also a recreation room on each floor. On this page you will find a map of the HaDiKo including the house numbering and in which is house which floor is located. The common rooms are marked in red. 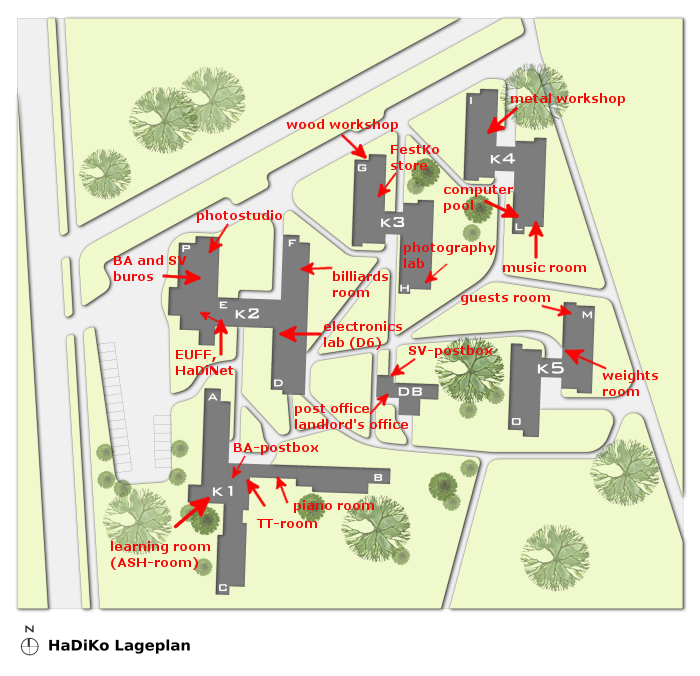 They are all located in the basements except for the rooms in K1 which are on the ground floor and the electronics lab which is on the sixth floor. Our dormitory is located in a very nice and central position, close to the University of Karlsruhe (not more than five minutes by bike). Nevertheless, the HaDiKo is surrounded by green. The large forest that begins just at our dormitory offers a great opportunity for jogging and other outdoor sports. Another nice feature is that there are few people being annoyed by us being loud at parties. :-) Nearby there are sufficient shopping opportunities, Karlsruhes' pedestrian area is located just on the other side of the university campus. The `Wildparkstadion', home stadium of the (once) quite successful KSC football club, is about 500 m air-line away from us. Right in front of our site there's a bus station, offering a reasonable good connection to Karlsruhes' public transport system.